Hi, My name is Serazul Alam and I am one of Coventry University’s Chaplains based in the Spirituality and Faith Centre. Having seen horrendous video footage and pictures floating around on social media of the plight of the Rohingya ethnic minority Muslims in Myanmar, I felt a natural urge to step in and assist the cause. 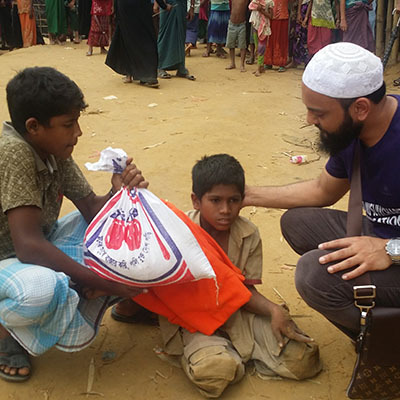 Members of the local community decided to fundraise for the 700,000 plus refugees seeking refuge in Bangladesh and following a successful fundraising campaign, we set off for Southern Bangladesh where the refugee camps are located. 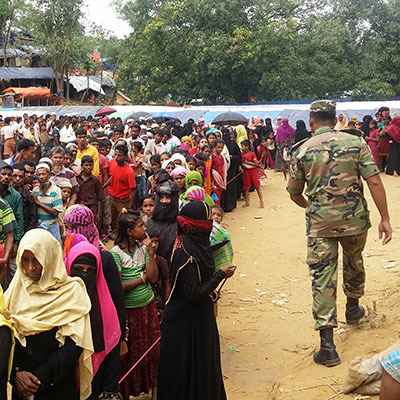 Many shanty camps dotted within the Cox Bazar district, each one holding anything up to 70,000 refugees transforming it into now possibly the world’s largest slum. Having travelled to Bangladesh previously I was looking forward to this visit, however rather apprehensive as the purpose of this trip was somewhat different and a first experience of a humanitarian aid mission. A few days of settling into Northern Bangladesh followed by a 16-hour road journey to the Southernmost District of Cox Bazar, we finally made it to our hotel room in Cox Bazar town. In this tourism centre of Bangladesh, with one of the world’s longest unbroken beaches, I could see the Bay of Bengal from my room balcony, stretching as far back as the eye could see. As this district also shares a land and sea border with Myanmar, it was less than an hour’s drive away from where hundreds of thousands of Rohingya Muslims have entered Bangladesh, by land and sea, fleeing what has been described by UN agencies as a state-led campaign of ethnic cleansing, annihilation, and possibly even genocide. The muddy refugee camps were made up of a maze of shanties of tarpaulin and bamboo. In overcrowded camps men, women and children walk around aimlessly, many barefoot and barely clothed, staring piercingly at us ‘foreigners’ as we passed by. In desperate need of food and clothes, most had been waiting overnight in queues at the aid distribution points. Having fled Myanmar with whatever they could carry, risking their lives along the way, these refugees have little or no belongings and are completely reliant on the goodwill of the Bangladeshi government and the international community. Amidst the chaos, it was all too easy to forget the reason why they were here in the first place; each refugee had a story to tell and many were carrying a psychological burden and memories of the untold horrors they had witnessed and escaped from. My heart was crying out for these refugees whilst in the UK and it was such a surreal feeling to actually be there. It was a privilege, an honour to be able to personally distribute aid by hand to these refugees. Assisted and escorted by the Bangladesh Border Guards, over five days we stopped at various camps, handing out food packs containing basic staples including rice, lentils, potatoes, onions, oil, sugar, toiletries, as well as clothes consisting of traditional lunghi’s (waist sarong) for the men and traditional dresses for the women. Looking into each and every refugee’s eyes I could not help but have flashbacks of the horrendous pictures and videos I had seen. I could see the pain, hurt, humiliation and desperation in their eyes and from the depths of my heart I greeted each one with the greetings of peace – ‘As-salamu alaykum’. For the first time in my life, this greeting never had so much heart and meaning behind it. One occasion we took a walk into the inner quarters of the camps to observe conditions and hand out sweets to the children – they rushed over from all corners of the camp sticking their little hands at us and tugging our clothes with huge smiles on their faces – priceless! Their living conditions are squalid, their future there bleak and uncertain, and with hundreds still flocking over the borders, I questioned how much of an impact we really had made? How long would the Rohingya remain in Bangladesh and were they really any worse off living in these camps than the miserable lives they left behind in Myanmar? Nonetheless, I had a gained a deep sense of personal gratification, a feeling of giving something back to humanity and an increased desire to help all those less fortunate around the world. If you would like to get involved in these types of community events and would like further information please contact the Spirituality and Faith Centre. You can also see what they’re up to on Facebook and Twitter.